Are standard debridement practices maximizing removal of bioburden? The current gold standard for tissue management in diabetic foot ulcers is regular sharp debridement to reduce bioburden. 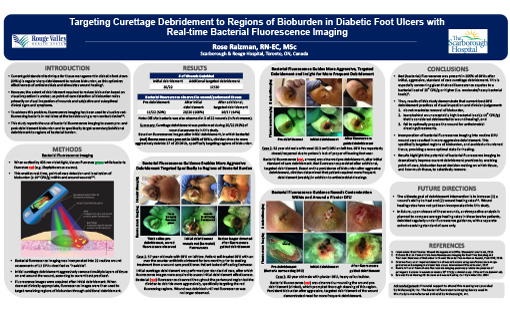 However, a recent study by Rose Raizman, RN-EC MSc, a wound care clinician, which used bacterial fluorescence imaging with the MolecuLight i:X after initial, aggressive debridement in 20 diabetic foot ulcer wound assessments, found that persistent bacterial red fluorescence was still present in 100% of these debrided diabetic foot ulcers. This led the wound care clinician to perform additional debridement under fluorescence guidance, specifically targeting the regions of remaining bioburden. Do not maximize removal of bioburden. Fail to optimally prepare the wound for antimicrobial dressings/treatments. As a result, using the MolecuLight i:X has the potential to improve current debridement practices by enabling point of care visualization of bacterial load, to specifically guide removal of bioburdened tissue and avoid un-burdened tissue. 1. International Best Practice: Wound Management in DFUs. Wounds International, 2013. 3. Edwards R and Harding KG. Bacteria and wound healing. Curr Opin Infect Dis. 2004. In this video, the clinician can be seen using a curette to debride a heavy callus on a patient’s diabetic foot ulcer. When using the MolecuLight i:X in FL-mode, bacteria produce red fluorescence. As the clinician debrides, you can see red fluorescent bioburden being targeted while regions of un-burdened tissue are being avoided (green fluorescent tissue). Learn more about guided debridement in this poster presented at CAWC 2017.